Bernie Sanders has made socialism a positive word once again, so it's the perfect time for books about the history of socialism in the United States. 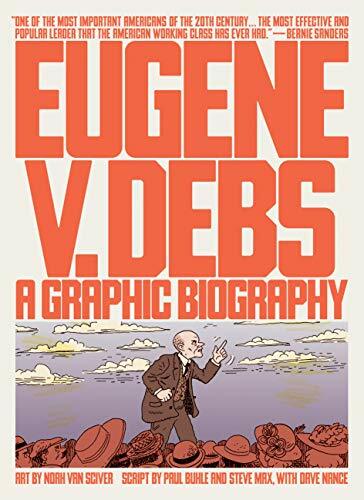 Eugene Debs was certainly the most important figure in the movement and Eugene V. Debs: A Graphic Biography does an excellent job of describing Debs’ life and work, his passion and purpose. This isn't easy history to grasp. There's a lot to cover, both chronologically and geographically. Add to that, the complicated cast of characters, and a reader has to juggle a lot of threads. The text makes this easier by introducing each section with an overview written like a standard history, followed by details made evocative and accessible by the graphic format. Some of Debs' arguments sound eerily appropriate for today, and clearly this book is meant to become as much political manifesto as history. It serves the purpose of both well, in words and in illustrations. The one major drawback is the academic backmatter one expects from a subject that was so well-researched. Though there's a “further reading” page, there is no bibliography. There is a timeline, but no quotations. Are the words put in Debs' mouth actual quotes or invented dialog? Many readers won't care, but teachers and librarians who might use this book in high school classes will miss that layer of academic assurance. In these days of invented news, after all, history and its foundations in actual events, real people, and verifiable sources matters more than ever.